There’s no rest for the wicked. Having played through the grinding ten game punch-up that was Operation Martlet (a campaign for Chain of Command) we’ve launched straight into the sequel: “The Scottish Corridor”. The action in this campaign follows on immediately from the end of Martlet, and represents the German attempts to pinch off a British salient in their lines by attacking the British from both flanks simultaneously. Can the plucky Jocks of 15th Scottish hold off a mixed force of German panzer boys? Allied forces had been ashore in Normandy for about 3 weeks. The Russians had launched the final decisive blow of the war in Europe (Operation Bagration) a week ago. The Soviet armies had already crushed the initial German defences and were about to unleash their vast reserves to exploit the breakthrough. It was vital that the pressure was kept up on the western front to pin as many of Germany’s reserves there as possible while the Russian bear tore the Wehrmacht to pieces in the east. The Allied landings in southern France (Operation Dragoon) had been pushed back into August. To the south in Italy there had been a moment of optimism when forces had finally broken through Cassino and out of Anzio, but now they looked to be running into yet another of Kesselring’s well-prepared defensive lines. 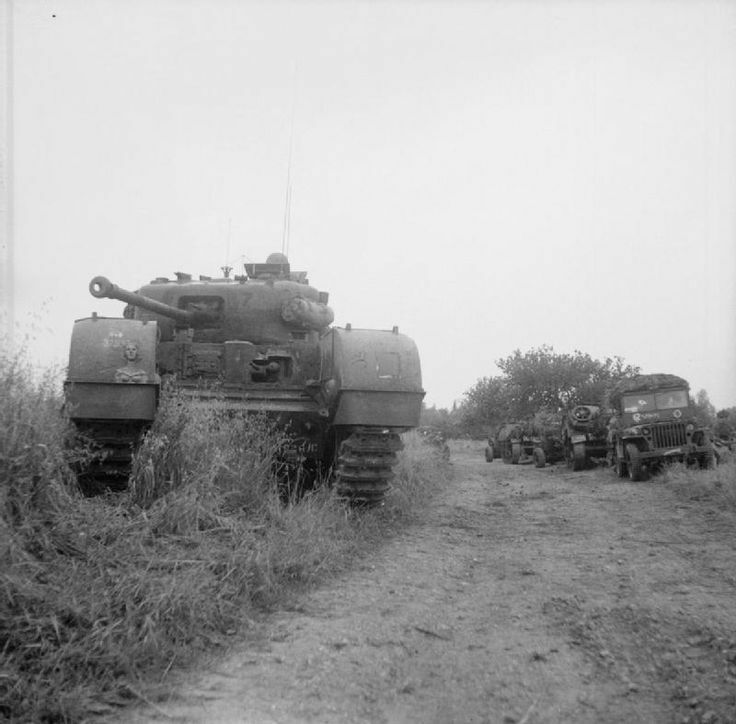 The operations in Normandy would be the western Allies’ only chance to put the Germans under serious pressure until Dragoon later in the summer. The overall plan was to give the western American end of the front a free hand to capture the port of Cherbourg and use that to break out and roll the front up. 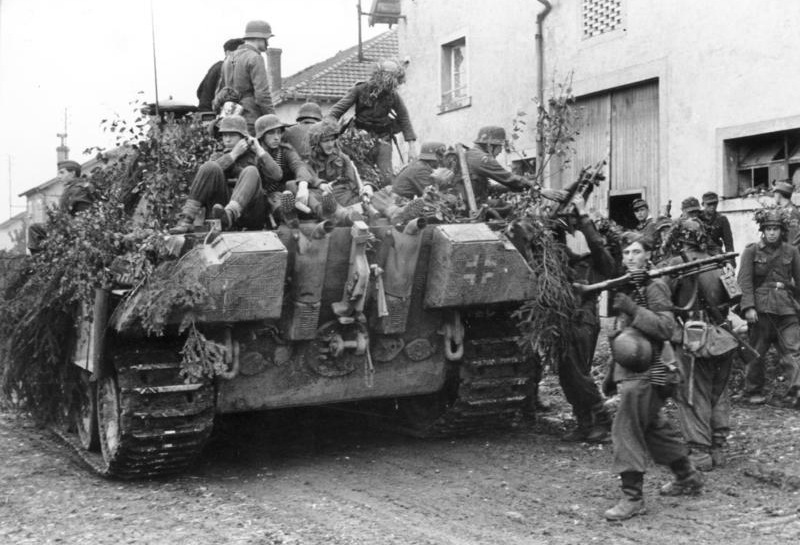 This meant pulling as many of the Germans’ elite mobile forces into the meat-grinder of Caen as possible. Montgomery knew the logistics hugely favoured his side, so planned an attritional fight with an unrelenting sequence of set-piece attacks. What he didn’t have enough of was manpower, and the gritty German defenders around Caen would bleed the British infantry savagely for every inch of ground. The attack was led by infantry supported by Churchill tanks and massive amounts of artillery. Any breach would be exploited by fast-moving Cromwell and Sherman tanks. Following hot on the heals of Operation Martlet just to the west (which we played recently) the 15th Scottish Infantry Division, the 43rd Wessex Infantry Division and 11th Armoured Division drove into the hard-pressed 12th SS to their front. The plan was to begin encircling Caen from the west, and after some hard fighting the British superiority in artillery and numbers began to wear down the Germans and a large salient began to form in the front. As they so often did, the Germans scratched together whatever armoured forces were arriving at the front, and threw them into the flanks of the “Scottish Corridor”. Two Kampfgruppes (“Weidinger” and “Frey”) would attack both sides of the corridor, supported by a handful of tanks. In our play-through of Martlet the Germans ended still very firmly in possession of the Rauray spur on the flank of Operation Epsom, so Kampfgruppe Weidinger is reinforced and starts its attack earlier than in real life. The campaign only represents one day of action, and it’s the moment when the British are caught by surprise and the Germans are very much the better prepared and better-armed force. Can the unlucky defenders of the Scottish Corridor stop the German thrusts before they link up and snuff out Operation Epsom? Like the earlier Operation Martlet, this is potentially a long campaign. Fighting can last from seven to twelve campaign turns. During this time the Germans must capture all six tables, while the British have to try to delay them as much as possible and force the campaign to go the full 12 turns. Rather uniquely the Germans are attacking both sides of the corridor simultaneously so there are two ladders. If the Germans win a game the next one must be played on the other ladder, so if the Germans win the “Probe at Bas de Mouen” the next game will be “An Encounter at Le Valtru”. If they fail to win a game either the British can counter-attack on that ladder, or the British can strengthen their defences and let Jerry have another crack. If one Kampfgruppe gets held up, it’s possible that the other one will capture all its objectives and cross over into the ladder for the other one and fight through the scenarios in reverse, in which case they all become Attack/Defend scenarios. There is one Wild Card available from turn five, which gives the British a free counter-attack with a fresh platoon and plenty of support. The campaign book states that the fighting starts at 0700 and ends at 2100, and each campaign turn is one hour. Since that would be 14 turns instead of the 12 described we’ve inserted two tea breaks into the fighting, one in the morning and one in the afternoon to get it to synch up. Victory conditions are simple: if the Germans capture all six tables they win. If the British hold one at the end of the day’s fighting it’s a draw. If they hold two or more the corridor is still open and it’s a British win. The Germans benefit from being well-supported and equipped in this campaign, with plenty of infantry and armour. The Germans have no fewer than five platoons of infantry to capture six tables (one of these is a bonus from their victory in Operation Martlet). Infantry platoons are well-manned, with three 9-man squads and plenty of LMGs. As well as plenty of good quality infantry, their support lists give access to numerous good offensive options, including Panther and Tiger tanks, and some rather scary flamethrower tanks. The scenarios give them generous amounts of support to choose from, and especially in the initial scenarios they can count on having the British both outclassed and outnumbered. The one thing that is missing from their lists are artillery options, as this was in short supply in real life. 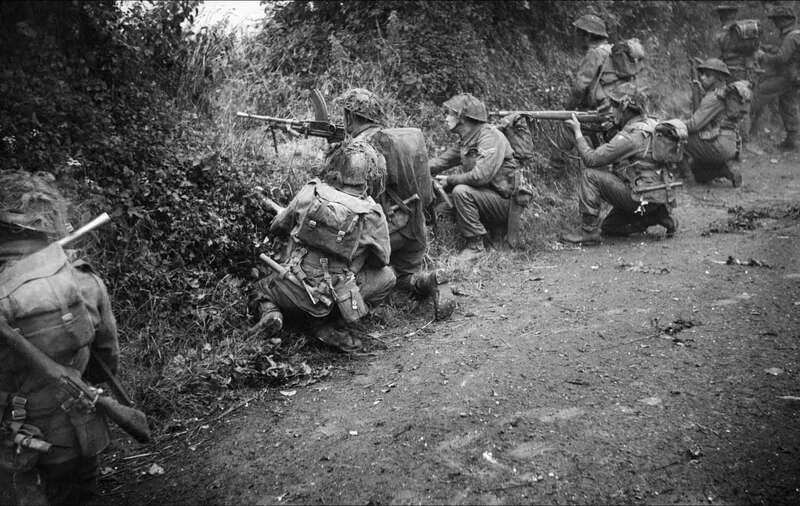 Infantry of the 6th Royal Scots Fusiliers, 15th (Scottish) Division, in action in a sunken lane during Operation ‘Epsom’, Normandy, 26 June 1944. On the British side infantry are in good supply, with each game using a fresh British platoon. The support lists and number of points are a different story though. The Germans have access to their heaviest tanks, but British AT options are fairly woeful. Only the 6pdr AT gun is available, and the performance of that and the PIAT against Panther and Tiger tanks could best be described as “optimistic”. The heavy Churchill infantry tanks are available, but suffer from being undergunned and can’t be considered a good counter to the German tanks. Sherman VC tanks with 17pdrs are available, but the lists force you to buy a 75mm Sherman first and in many cases there just aren’t enough support points available to do that. This leaves the British with either no counter to the Panther and Tiger threat, or the unappealing option of spending almost all their support on a single tank which still only partly counters it. If they spend big on the Sherman 75mm/17pdr combo and the Germans instead boost their infantry options the British infantry will likely get massacred. If the Germans do bring a big cat they’ve still got a decent chance of killing the lone Sherman VC and romping around the board. On the plus side the Brits do get artillery, including an enhanced bombardment that lasts through the second turn of the game, but the way artillery works in CoC makes it a less useful option in defence than attack. If the Brits manage to launch counter-attacks it could be a useful option. One thing that is missing from both support lists are mortars. This seems odd, as infantry always bring their mortars with them, that’s the whole point of mortars. I do wonder if this was an accidental omission, as I can’t think of any good reason why it would have been left off on purpose. We just started this campaign ourselves here in Tucson AZ. We complete the first two games: I’m playing the Germans and my buddy the Brits. The Germans do have to account for losses, but I think the support options could balance that out. In the second game, I had a Flamm Panzer III available, and that changed the flow in my favor. This should fun to track such a campaign myself, as my oldest son did that we played the other campaigns. Good gaming! We’ve done the first two games too, Greg. Look out for the reports in the next couple of weeks! Have you written your games up? Would love to have a read. Wow……it sounds like quite a challenge for the British, but I am still only half way through Marlet so lots of time to ponder things.